A bit of the "matrix" information on the disc was intentionally obscured. Hand written, but not necessarily meant to take the place of the obscured information, is TLPS- 939A & TLPS-1939B as well as one "impressed or stamped" number TLPS-1939B. Also, from the disk information, the pressing date may be 1961. Seems as though there was some type of issue with this release. From the back cover: The Bobby Richards Sextette is a group of musicians which have gotten together for the purpose of performing cool music; dance, jazz, Dixieland, smooth or any type of music you care to name. Their repertory is practically limitless and the amazing fact is that all arrangements and music are filed away in their heads; therefore they never use sheet music in a performance. Many, many times they start out on a planned set and end up with a spontaneous, set, for they feel the pulse of the audience and take it from there, performing cool variations. The arrangements or "spontaneous" nature of the songs do smack of variations or blends of "style" as mentioned in the notes. The fantastic cover design and decent jazz set make for a nice package. MVM is a budget label and my copy, I think sounds less than very good or lacks groove depth which I now associate with cheap production rather than dust or over-play. Apparently RCA released this title/catalog number featuring several cover designs, both of which seem somewhat obscure. 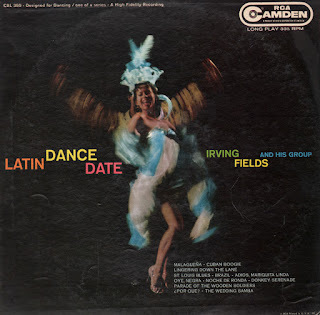 Not thematically consistent, the set features a few vocal harmony tracks and other instrumental tracks that have, to my ear, little or nothing to do with a "Latin" beat. 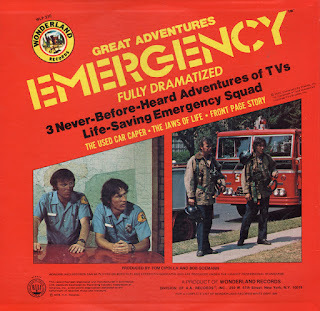 RCA seems to have "designed" this set in a rush. None-the-less, the cover art is well designed and tracks like Brazil, save the day. Available from various vendors so I will not be posting a sample. Strong jazz flavored Space Age jazz Bossa set. 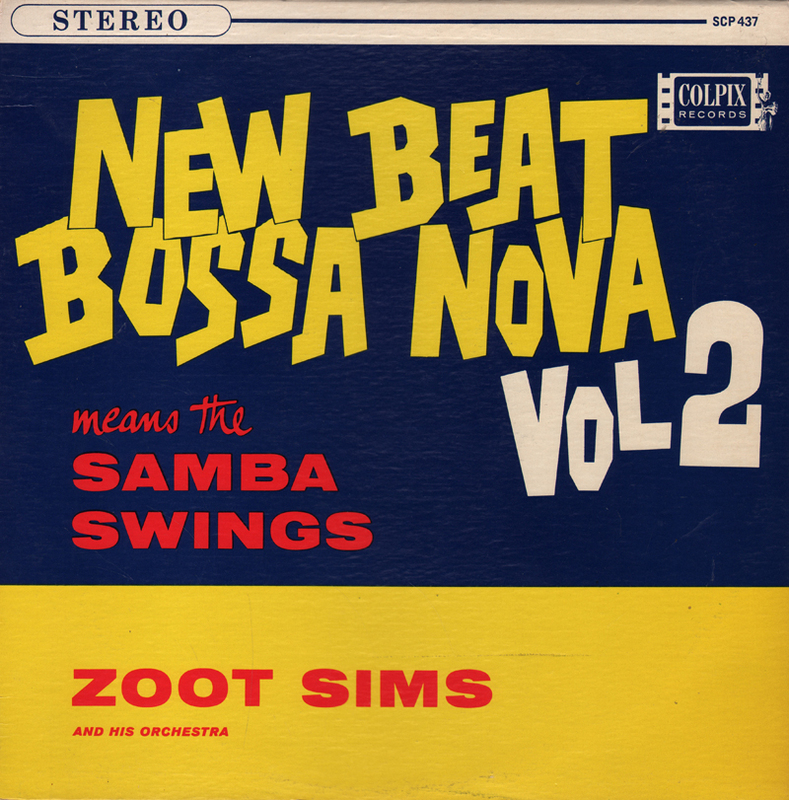 From the back cover: In "New Beat Bossa Nova, Vol. 2" Sims is again supported by a "Who's Who" roster of musicians. 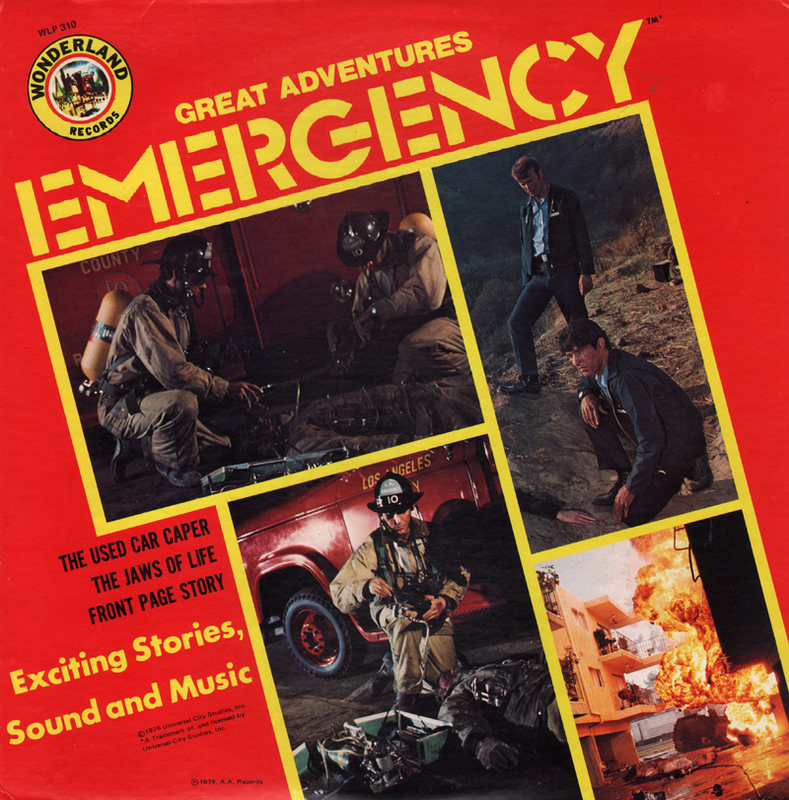 Heard on flute are Spence Sinatra, Ron Odrich, Jerry Sandino and Phil Bodner. Sol Schlinger backs him on bass clarinet. Jim Hall and Barry Galbraith are much in evidence on guitar, and Milt Hinton adds his distinctive bass. The percussion section includes Willie Rodriquez, Ted Sommer, Sol Gubin and Tommy Lopez. 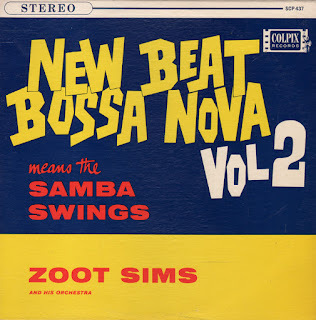 From Billboard - March 9, 1963: Bossa nova and Zoot Sims return here for another splendid go. The album contains excellent arrangements from Al Cohn and Manny Albam and smooth and swinging work from tenor saxist Sims. 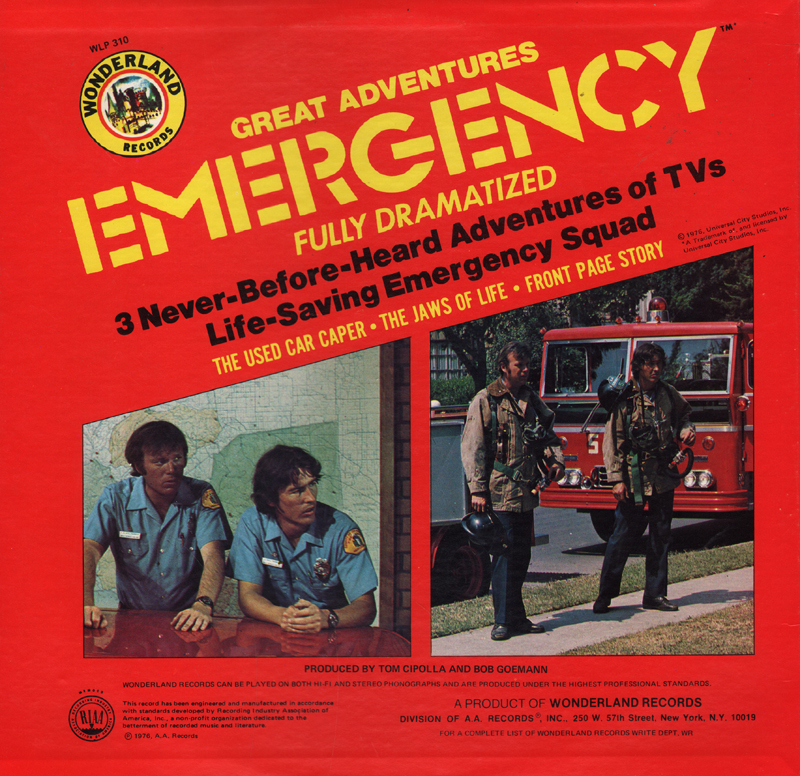 Flutes and guitars with rhythm are in support and the album has distinctive arrangements of "Bernie's Tune," "Lonesome Road" and other standards in the rhythm. Available from a variety of online sources so I will not be posting a sample. From Billboard (review of the 1955 Norgren MGN 1016 release) - March 26, 1955: The flashy talents of clarinetist De Franco and pianist Peterson jell neatly here in the well-arranged ork setting. 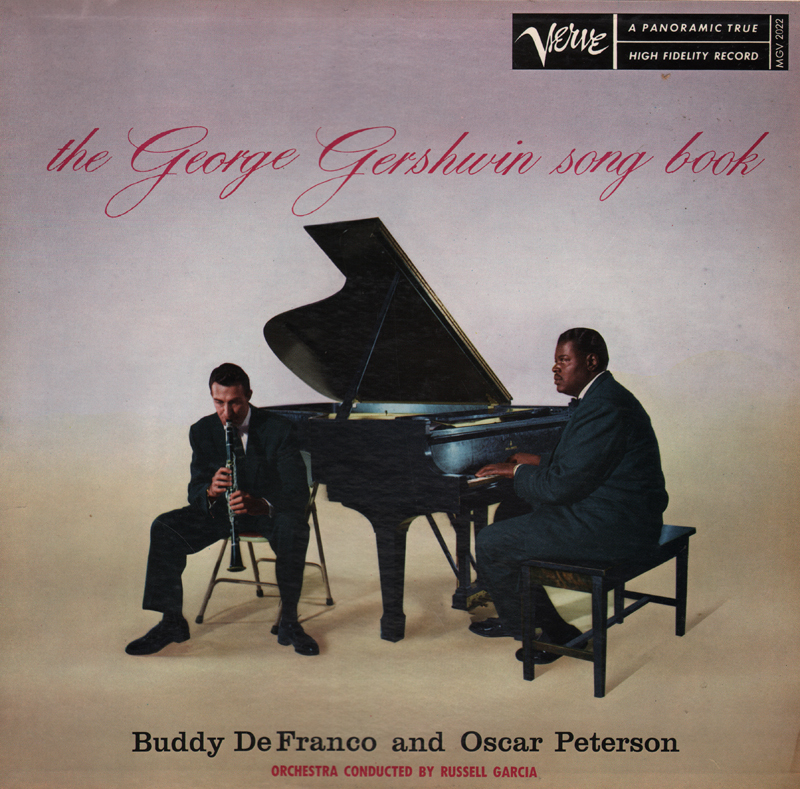 De Franco has won all of the jazz polls for the past nine years, and Peterson usually come close in his department, so these are names to reckon with, The fact that they play Gershwin isn't important, since both men reduce the material at hand into what has become their personal cliches. Billboard nailed their review. You don't have to like Gershwin to enjoy this set. Gracia's more traditional orchestrations blend with and completely support the jazz passages by De Franco and Peterson. Good stuff. From the back cover: Concerning the musicians themselves, Boniface "Buddy" DeFranco is the one clarinetist who has assumed the mantle of Benny Goodman's successor. A veteran of such bands as Tommy Dorsey's, Gene Krupa's and Charlie Barnet's, DeFranco is know best for his expressive tone and brilliant technique. 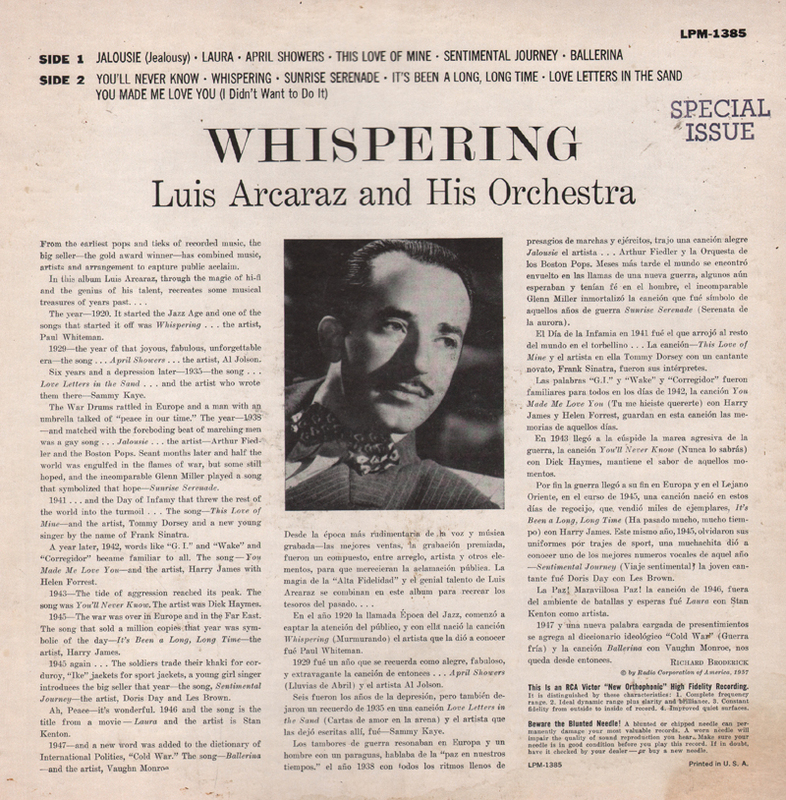 He has won any number of magazine polls as the foremost clarinetist of the 1950s. He is a native of Camden, N. J.
Paints Oscar Peterson, a Canadian from Montreal, is another possessed of a dazzling technique and readily identifiable sound. From several years he was featured with the Johnny Holmes band, on of Canada's most popular. Finally, in 1949 Peterson was lured to the United States where he has been heard ever since both on concert tours and with his own trio, comprising Ray Brown, bass, and Herb Ellis, guitar – both of whom are also on this album. Available from online retailers, so I will not be posting a sample. 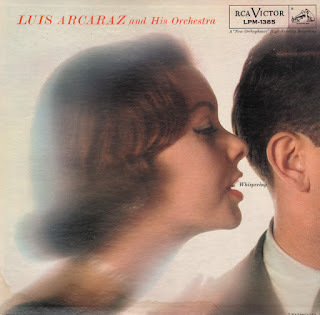 Back cover notes, by Richard Broderick, are presented in both English and Spanish and feature curious notes about the tunes, rather than offering us any Arcaraz biographical information. Notes focus, for the most part, on how each song relates to a war. For instance, this last paragraph: 1947 – and a new word was added to the dictionary of International Polities, "Cold War." The song – Ballerina – and the artist, Vaughn Monroe. 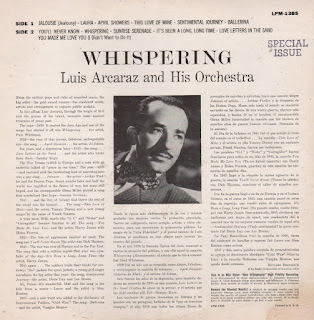 There are no references in the notes that seem to support the "Whispering" cover theme and the arrangements, while pleasant period big band, are not stylistically "soft or quiet" sounding.